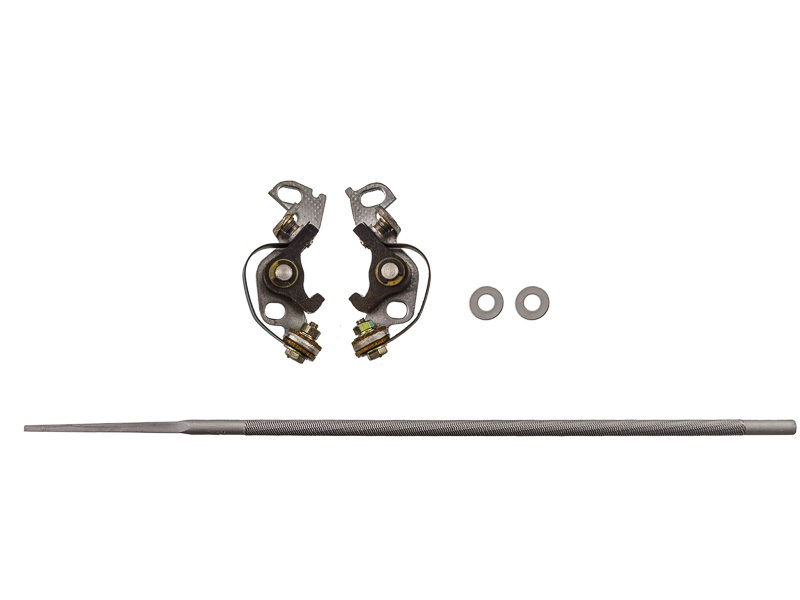 Parts: Ignition Contact Points Set for Honda CB350, CL350 Scrambler, CB360, CL360 Scrambler, SL350 and CJ360 (includes Left & Right contact point). Why You Need This: What is that? Can not get your timing right or plugs are not firing? Looks like winter wonderland of corrosion under the points cover? After decades of sitting idle, do yourself a favor and replace the contact points. Points are a wear item so if you are unsure of the condition of the set in your bike, swapping them out is a wise idea. 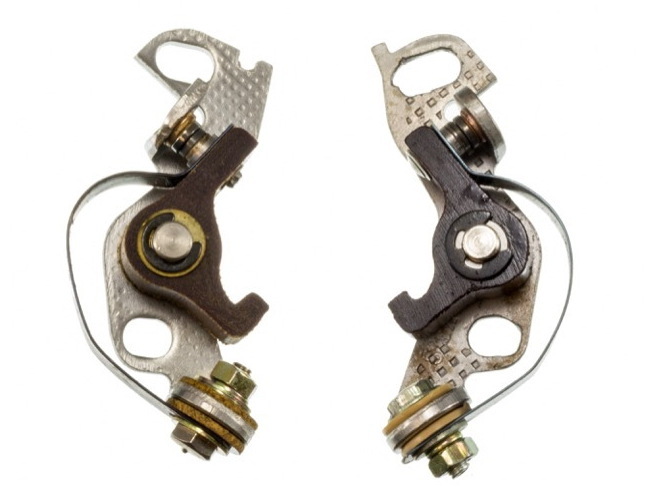 It is has become very tough to find ignition points for the Honda CB350, CL350 scrambler, SL350 as well as the CB360, CL360 scrambler and CJ360 family of motorcycles. After 40+ years the supply of NOS (new old stock) Japanese made points has finally dried up. However the crew here at Common Motor is always determined to help you keep your vintage Honda on the road. We have been able to source replacement ignition points for these bikes; however, these modern points (made in China) do not have the manufacturing precision control of the old points from Japan. They will work, but first must be modified to properly function in your motorcycle. The good news is that we have included the parts, tools and instructions needed to modify these ignition points so that they function smoothly, and properly adjust so your bike runs like it was new. Worry not as the modifications are minor and easy to do, but are necessary for things to work like they are supposed to. Please watch our VIDEO above and read our tech article about the points modification process. Points are sold as a set (left and right) and includes shim washers as well as a round file to enlarge the mounting holes. If you want to give your ignition system a complete overhaul check out our Honda CB350 / CB360 / CL350 & CL360 Scrambler Ignition Rebuild Kit. Installation Tip: Inspect the advance mechanism under the point plate to see that it is working smoothly. Exact point ignition timing is essential to a smooth running engine, the gap of the points is subjective. We set the points with a test light not to be confused with strobe style timing light. A small smear of white lithium grease on the points cam will extend the life of the rubbing blocks. Ignition timing should be adjusted every 1,500 miles. We hope that you get between 4,500 and 6,000 miles out of a set of points before they need to be replaced. Be sure to watch our VIDEO on how to set ignition timing on the Honda CB350 / CB360 / CL350 & CL360 Scrambler (also the CJ360 and SL350). These points work well with my CB 360. The only problem installing them is that the top mounting hole is not correctly placed. I was amazed that you included with the points a file to enlarge the hole to make it fit. Also included were the replacement washers that do a better job of spacing the points for a better fit. I was confused why the file was included till I watched your video explaining about the issue of the misaligned hole. Your videos are great by the way!